Jesus Christ's message was concerned with the government of nations. Christians are those who follow Christ, here's what He would do. World war threatens to explode in The Middle East and other "hot spots" Frightful. nuclear war! War That means the annihilation of civilization. The world this minute is in grave danger. The issue is a matter of government! Few realize it because they do not hear it today, but the Gospel of Jesus Christ the Gospel Jesus brought from God and preached was a message about government! Many of you have undoubtedly read the book In His Steps by Dr. Charles M. Sheldon. It has been one of the all-time best-sellers. It is the story of an entire congregation that set out to do, in all circumstances daily, just as Jesus would do — to "follow His steps," as we are admonished by Peter. My only criticism of the honk is that its characters, like most people who think they follow Jesus, acted as They supposed Jesus would act instead of studying the Bible to find out how He did act. The apostle Paul said "I am crucified with Christ; nevertheless I live; yet not I, but Christ liveth in me" (Galatians 2:20, Authorized Version). He admonished, "Let this mind be in you, which was also in Christ JESUS" (Philippians 2.5). To understand what Jesus would do we must take a quick overview of the governments of this world from its foundation until now. This is necessary for a true perspective.We are prone to view politics. government and World events from the standpoint of this present world. But as this brilliant shining, "star of the dawn Lucifer — contemplated his glory, pride lifted him up, ambition seized him and suddenly he became dissatisfied with a rulership limited to one single planet. Just as the sins of the antedeluvian world brought physical destruction to the earth by the Flood — just as the fornication of Sodom and Gomorrah brought physical destruction and chaos to those cities by fire — just as the sins of the present evil world have doomed it to physical destruction once again by fire so the sins of the angels caused the face of the earth to suffer great violence and it became chaotic, in confusion. waste and empty (Genesis 1:2). First, Adam was given opportunity to qualify as world ruler. He could have become successor lo the former Lucifer, now renamed Satan (meaning "adversary, rival, aggressor"), Adam was put to the test to determine whether he would obey God and prove able to rule with God's laws. Thus he placed himself and his children under the rule of Satan. He failed to overthrow Satan, he failed to prove he could obey God and carry out God's government over those God should have placed under him. Had Adam obeyed God and proved able to defeat satan in this test, he could have partaken of the tree of Life, he would have been begotten of God, later born of God, changed from mortal human to immortal and Divine God of the very Family — the Kingdom — of God! All earth's mortals, as his children, would have been under his rule. He would have become world ruler forever! But Adam placed himself and his children under the rule of SATAN. Just how Satan manipulated human mortals in the ways of government on earth during the first 1,600 or 1,700 years, there is no historic record. We know merely that with very few exceptions, humans under Satan's invisible sway followed the course of human passions, the wickedness of man was great on the earth and God destroyed all but eight souls by the flood. Noah and his descendants should have learned their lesson, but they didn't. Satan found in one of the great-grandsons of Noah, Nimrod, the grandson of Ham. a very able and powerful man who could he used politically. Through Satan's influence, instilling great ambition through greed and pride, this Nimrod organized the people into a system of human government by which man ruled over man contrary to the principles established by God. Such government never could be good or bring blessings to humanity, but the Eternal purposed to permit man to learn that lesson by hard experiences. We are learning it still, and haven't learned it yet. Now notice how the present world's society became organized. Nimrod organized the present world's first government the city of Babylon. Later he organized Nineveh and other cities. He instituted the system of regimentation, whereby one or a few at the top, by directing their efforts, profit from the sweat and labor of others. Then an ambitious king, swayed by Satan's philosophy, seeking more worlds to conquer, organized a portion of his manpower into a lighting force and by aggression ruled over adjoining cities. Thus nations were born, and then empires. This Babylonish principle of government, intertwined with economic manipulation, has ruled the world ever since. It has ruled under various forms — whether called oligarchy, monarchy, dictatorship, autocracy, democracy communism or Nazism — but it's the same old BABYLONISH PRINCIPLE under slightly different modes of administration. And this is the origin of what we call CIVILIZATION. It's forms of administration have undergone change, but its basic principle has remained the same competition and strife based upon greed and vanity. In ancient Rome the politicians ruled over the church, business and society. Then after A.D. 554, the church ruled over the state, business and society. In America. where we are supposed to rule ourselves, it has been a constant struggle for dominance between big business and the politicians. Babylon means "CONFUSION". Competition and strife have produced confusion in the world. And God is not the author of confusion (1 Corinthians 14:33). Now we come to the reason for needing a true, perspective. Most churchmen today, viewing everything from the perspective of this world TODAY, blindly assume this is God's world. They see certain forces of evil in it, and these they feel they must oppose. They see the Christian duty to be that of working to make this a better world. This is not a world of God's making. This is Satan's world! Satan is the invisible god of this world, he is the author of its organization, its basic philosophies, its systems of government, business, society yes, and RELIGIONS! This thing we boast of as civilization is in actual fact, Satan's handiwork, not God's! Strange as it may seem, that is true! All nations — not just the heathen powers, but all nations. including ours — are deceived, swayed, led, by Satan (Revelation 12:9, 18:3, 20:2-3). The Bible speaks of this world as '"this present evil world" (Galatians 1:4, AV). When Jesus reached the approximate age of 30 He was baptized and anointed with the Holy Spirit as the Christ. But before He preached a word — before He could even enter upon His ministry He, like the first Adam, had to meet Satan in the greatest contest in all eternity! Jesus withstood Satan's temptations, rejected his deceptions, refused to obey him, conquered him by obeying God! Then He commanded Satan. "Away with you!" — and the devil obeyed and slunk away! Then and there Jesus Christ qualified to succeed Satan as RULER OVER ALL THE EARTH! But the time had not yet come for Him to be inaugurated into office. First, He had to return to the throne of God and receive God's official authorization. God had allotted ONE Millennial Week, that is, a period of seven thousand-year "days" for the accomplishment of His divine purpose in humanity on this earth. That divine purpose is the creation of righteous, spiritual sons of God. God allotted the first six of these thousand-year periods for Satan's labor of deceiving the human race 6,000 years in which man is permitted, if he chooses, to suffer from the "labor" of sin. When the first Adam failed to depose Satan, God extended the duration of Satan's dominion over the earth for 6,000 years. This was necessary for the accomplishment of God's great purpose. Then, as "in six days the Lord made the heavens and the earth, and on the seventh day He rested and was refreshed'" (Exodus 31:17). even so in the seventh millennium, humanity is to "rest" from sin and those Converted are to enter into God's spiritual rest. In this coming Millennium, Satan shall not do any work — that is his work of deceiving the world! Then Jesus will return to earth this time in all His power and glory as King of Kings and Lord of Lords. But in God's great plan, He has purposed that Jesus shall rule-by and through many saints then made immortal. They shall form the world-ruling kingdom — the Kingdom of God — that shall rule over all the mortal nations of earth. Time had to be allowed for their conversion. So, alter meeting and conquering Satan, Jesus devoted three and a half years to teaching the Gospel to His disciples. His Gospel the only true Gospel of Jesus Christ — is not what most people think today. Few have heard it, today! It was and is a Gospel of good government! The word gospel means "good news " And what Jesus preached, the message He brought to mankind from God was the good news of the coming GOVERNMENT OF God, the coming world ruling government that shall overthrow, blast out of existence and rule in place of every present government on earth! And His Gospel was merely, as one might say, His political platform for His Kingdom, He revealed the way to enter it as one of its immortal citizens — the way of salvation. He revealed its laws. What Jesus taught was that this present world, with its governments, its religions, its economies, its society, is an evil world — it is Satan's world — it is a world in competition against and AT WAR AGAINST — His Coming Kingdom — THE WORLD TOMORROW! No, Jesus did not enter into THIS world's politics! He called His disciples out of this present evil world — out of all its customs and philosophies and ways to a life of SEPARATION from the world. Jesus said to His disciples, "Follow Me!" And one cannot follow Him and also follow this present world! He did not mean for Christians to go out of the world, physically. He knew they must live in it, but He taught that they should not be of it. In his final prayer for His disciples, Jesus said to His Father "I do not pray that you should take them out of the world, but that you should keep them from the evil one. They are not of the world, just as I am not of the world" (John 17:15-16). Thus Jesus's disciples live in this present evil world as though they were foreigners, here merely as the guests of the nation where they reside, as ambassadors for Christ and His coming Kingdom, here as representatives of His coming Kingdom, not of any of this world's governments. As the Word of God reveals in II Corinthians 5:17-20: "If anyone is in Christ, he is a new creation: old things have passed away . . . therefore we are ambassadors for Christ." The United Slates sends an ambassador to the Kremlin. He resides for the time in Moscow. The Christian in the world today is in the same relative position as the American ambassador in the Soviet Union. He is not a communist, he does not regard the Soviet as his government and he knows well it is a government mortally opposed to his government. He does not serve the Soviet government, nor enter into its politics, nor devote his time in Moscow to trying to eradicate the evils he sees in their system, or in making their state a better state, or voting, or entering their army or fighting for their cause. Yet, he subjects himself to all their rules and regulations that in any way concern him or his life while there. If they drive automobiles on the left side of the street, he conforms to their regulations he does not oppose them: he is SUBJECT TO them while there, endeavoring to cause them to like him so as to better represent the interests of his government, the United States. Jesus taught His disciples to render unto Caesar the things that are Caesar's, Specifically He was referring to payment of taxes. If the government levies taxes pay them. He will appreciate the privileges, advantages and opportunities extended. He will regard himself as the paying guest of the country where he resides, and he will act with due courtesy, sub mission to its rules and regulations, insofar as they do not conflict with the commands of God and submission to their penalty where they do. Jesus did not try to reform Caesar He did not try to make this a better world, Rather, He preached the doctrine of a radically different world to come and He called His followers out of all participation in this present evil world and to allegiance to His KINGDOM that is to come. But His world is the world Tomorrow! His Kingdom, He told Pilate, is not of this world that is of this AGE, this present time. This is Satan's world and Christ did not come to reform Satan or improve Satan's handiwork, but to save His followers from Satan and his system. Christians are called to be separate from the world and all its affiliations, whether racial, political, economic or religious (II Corinthians 6:17). They are not to live by the philosophies, customs and ways of this world, but by EVERY WORD OF GOD (Luke 4:4). Jesus taught us not to live by traditions of the present civilization, but by God's laws, and He taught here that those who disobey this teaching WORSHIP Him IN VAIN. Yes, thousands call themselves Christians, think they are converted, believe in Christ, worship Him. but worship Him in vain, following the course of this world and its customs and ways, instead of the commandments of God (Mark 7:7-9)! There is now to be one more resurrection of the Roman Empire a United States of Europe now presently forming. But finally, at Christ's Second Coming, "the saints Of the Most High shall receive the kingdom, and possess the kingdom forever. even forever and ever." These present governments are to run their course "until the . . . time came for the saints to possess the kingdom." That time has not yet come. Until then Christians are to obey God and be subject to the powers that be. When Jesus comes again, it is proclaimed. "The kingdoms of this world have become the kingdom of the Lord and of His Christ, and He shall reign forever and ever" (Revelation 11:13) Then it is, as Jesus has said. "He who overcomes, and keeps My works until the end, to him will I give power over the nations — he shall rule them'' (Revelation 2:26-27). The smashing of the present governments of the world is pictured in Daniel 2.34-35, 44. Then Satan shall be shorn or power to rule the world (Revelation 20:1-4). His qualified successor Jesus Christ, shall then be inaugurated into office. Then begins the Sabbath Millennium of Jesus Christ's reign — when He shall set His hand again to save Israel and the world. What. then, would Jesus do in this time of presidential election? He would WARN true Christians. "COME OUT of her [this world's governments, this Babylonish system], my people, lest you share in her sins, and lest you receive of her plagues" (Revelation 18:4)! What would Jesus do? 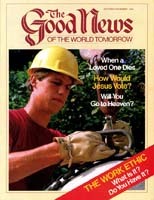 HE WOULD BE TOO BUSY PROCLAIMING THE GOOD NEWS OF THE COMING WORLD-RULING KINGDOM, and the way of salvation, to take any part whatsoever in the politics of this present evil world, or in any man-made form of government that is DOOMED very soon to be destroyed and replaced by the theocratic government of THE KINGDOM OF GOD! Our mission is as ambassadors Of Christ — as advance emissaries of His KINGDOM to WARN the world of its plight and present danger, to proclaim to all nations the good news of the Kingdom of God!